Our new research report on the global electric blanket market presents a brief scenario and the dynamics prevailing in the global electric blanket market. This comprehensive research report delivers value in terms of segmental analysis and forecasts on the global electric blanket market across regional levels as well as from a global perspective. With the help of extensive research, our analysts have studied how different market dynamics are likely to impact the current and future scenario of the global electric blanket market, thus providing useful insights to market players to plan their differentiating strategies capable of evolving with the changing market landscape with a view to achieve competitive advantage in the long run. We have analyzed the key trends, drivers, restraints and opportunities and their magnitudes across various regions of the globe while studying this sector. Impact analysis of key growth drivers and restraints based on the weighted average model are included in the report to better equip and arm clients with crystal-clear acumen and decision-making actionable insights. This report provides historical data of 2012-2016 along with value and volume forecast projections for the period 2017 - 2025 in terms of revenue (US dollars). It also includes detailed pricing analysis by type as well as the electric blanket market value chain analysis. Nowadays, consumers are spending a lot to keep themselves warm as well as properly insulated during the winters. There are various ways through which people can do that and today, a new type of blanket is dominating the market – electric blanket. Electric blankets can be warmed before use. Electric blankets are getting maximum attention among consumers owing to the various benefits such as allowing consumers to access multiple features and delivering maximum comfort. 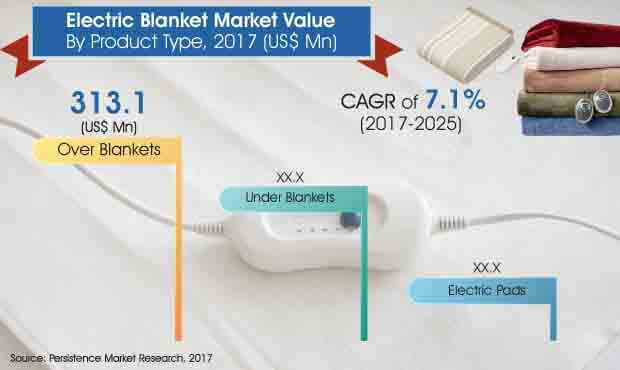 The global electric blanket market is anticipated to witness increasing growth owing to growing consumer awareness coupled with the advantages associated with the product. Different types of electric blankets available in the market include over blankets, under blankets and electric pads. As the name suggests, over blankets go over the body. Under blankets are also known as heated mattress pads or electric fitted sheets that fit over the mattress and below the bottom bed sheet that provides heat from below, whereas electric pads are heating pads used for warming parts of the body in order to manage pain. Among these, the over blanket market is expected to reach the highest market value of over US$ 530 Mn by the end of 2027, growing at 7.0% CAGR during the forecast period. Whereas, the under blankets segment leads in terms of higher CAGR with a 7.2% growth rate projected during the forecast period. When the warmness generated by a home heating system is not enough, an electric blanket helps in keeping the wearer warm and cozy, along with minimizing the overall home heating cost. Electric blankets have various associated features including lesser energy consumption. Though electric blankets consume small amounts of energy as compared to a furnace, these devices can still increase the monthly electricity bill. However, if the user operates the electric blanket at less than the maximum temperature setting, it may save overall heating costs. Manufacturers are also continuing the process of innovation and coming up with new features like waterproof blankets, battery powdered blankets with mobile chargeable sockets, light weight, durable, machine washable, and water resistant. Also, other features like machine washable and stain resistant electric blankets make their usage clean and friendlier to consumers. Such features are attracting a large number of people. Consumers aged above sixty are especially sensitive to the harsh and bitter weather and are thus giving electric blankets a try. Technology is helping revolutionize senior care, and electric blankets are proving to be an effective way of taking care of elder consumers. Senior consumers have expressed several advantages of electric blankets over traditional heating appliances; an extremely hot and stuffy room caused by the use of a room heater can be avoided. Investing in the electric blanket market can be a high risk business. Many companies invest substantial funds on the research and development, designing, packaging, and promotion of the product, which they only propose to sell for two to three months, because it is impossible to sell outside that time period. Electric blankets are winter seasonal products, mainly sold to consumers from September through the end of January, making it a high risk business. Another aspect of electric blankets is the cautious use. The improper use of an electric blanket may make it a dangerous addition to a bed. Overheating the body with an electric blanket when pregnant can be risky. Pregnant women should not use electric blankets because they produce low frequency electromagnetic fields that enter the body. A higher core body temperature may cause harm to the fetus, mainly in the first trimester. These factors are likely to restrict revenue growth of the global market.